'Why don’t young athletes in sport just quit?’ Starting with this question and drawing on existential philosophy, phenomenology and hermeneutics, Talent Development, Existential Philosophy and Sport seeks a deeper understanding of the experience of being a talented young sportsperson striving to become an elite athlete. As an alternative to conventional approaches to talent development governed by a worldview of instrumental rationality, the book introduces key ideas from educational philosophy to describe talent development through the concept of elite-Bildung. It pursues an existential understanding of developing in sport as a process of freedom, self-transcendence, striving for excellence and building up habits. The book highlights a range of ambiguous and intriguing existential phenomena – most prominently wonder, question, expression, humour and repetition – and reveals an existential layer of meaning within talent development in sport, which can facilitate the process of becoming an elite athlete and give young athletes a number of reasons not to quit. By deepening our understanding of performance and development in sport, and the process of becoming an elite player, this book is important reading for any serious student or researcher working in the philosophy of sport, sports coaching, sports development, sport psychology or applied sport science. Kenneth Aggerholm is an Associate Professor at the Norwegian School of Sport Sciences. He has a Ph.D. in sport philosophy and is a former professional football player. He enjoys a broad research interest, ranging from gender studies over talent development in elite sport to (re)habilitation and adapted physical activity. 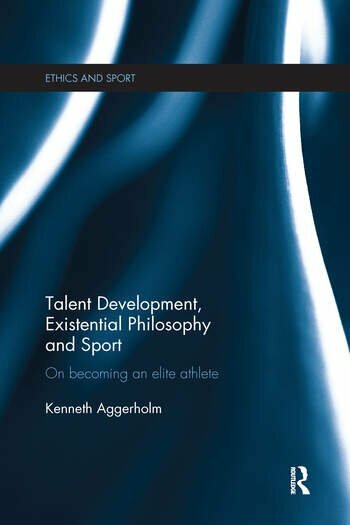 Kenneth is a member at large of the International Association for the Philosophy of Sport and has published in Sport Ethics and Philosophy, Journal of the Philosophy of Sport, the Routledge Handbook of Sports Coaching and the Routledge Handbook of the Philosophy of Sport.